Designed for Glock 42 and 43 semi-automatic pistols, the high-output CenterFire LED weapon light offers the same performance that distinguishes LaserMax Patented laser systems. 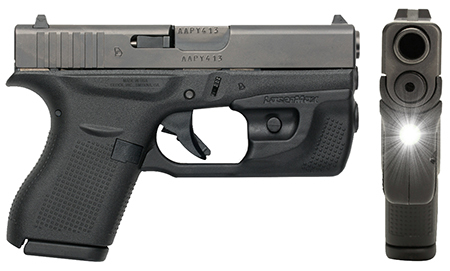 The CF-G42-LC mimics the styling of the Glock so well it is hard to tell where the pistol ends and light begins. Quick and easy installation with a virtually indestructible LED emitter. It is designed for optimal peripheral illumination. It is user programmable for constant or strobe mode to cause disorientation. Its ambidextrous tap on/tap off activation will time out for shutdown in 10 minutes to prevent battery drain. It is covered by a 5 year warranty.